A visit to Yellowstone National Park in Wyoming was a lifelong dream and last fall I finally I got my chance. During my end of September trek, the sky was unfortunately laden with gray clouds as the first snowfall was expected. But snowy skies would not damped my spirits; I had entered the hallowed gates of Yellowstone — the 2.2 million acre gem that shines with incredible landscape diversity. I drove along with a mixture of goose bumps and glee. Driving within the park proceeds slowly. Backups occur whenever a large animal appears. Drivers simply stop in the middle of the road and attempt to take photos out car windows. Many step out of their vehicles even though they are warned not to do so. I found myself snaking up and over a forested mountain pass, then gazing out on a grassy valley filled with bison and elk. 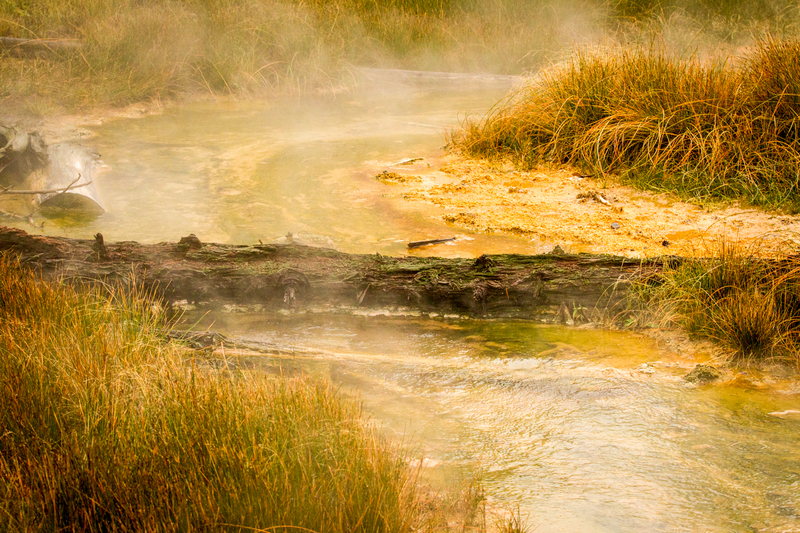 I passed otherworldly geo-thermal hot spots, boiling mud pots and, of course, shooting geysers like Old Faithful. Honestly, this park showcases the most jaw-dropping variety of mystical, movie set landscapes I have ever seen. Good fortune was shining on me as I had secured reservations at the historic Old Faithful Inn, which is operated by Xanterra. 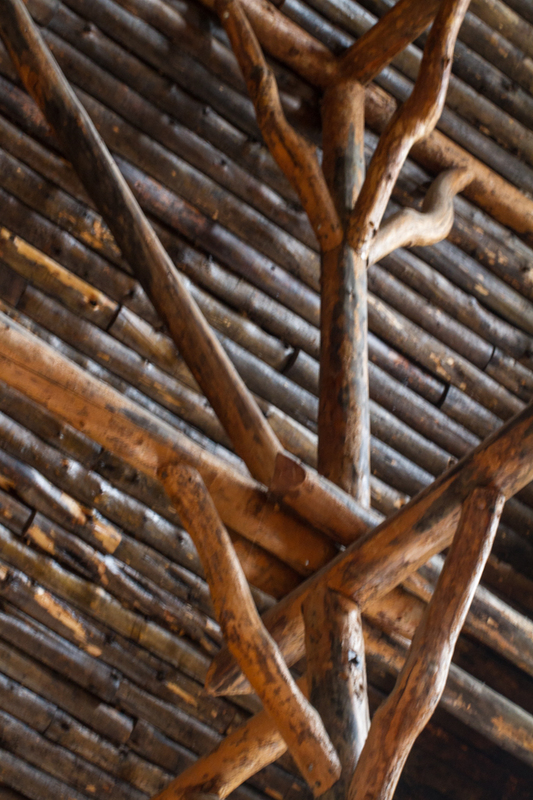 The rustic timber constructed lodge first welcomed guests in 1904. It has withstood severe winters, a 7.5 magnitude earthquake and the fires of 1988. I was overcome with gratitude and humbled when I stepped into the massive 76 feet, six inch tall lobby. The twisted wooden supports are tree trunks and a huge fireplace and chimney beckon. You are pulled in and just want to sit down and savor the space. One floor up rests a bar, perhaps an even better place to spend a little time enjoying the rustic setting. The designated National Historic Landmark was the design of Robert Reamer, a 29-year-old architect from Ohio who utilized local logs and stone to create a semi-indoor forest. Construction of the original 140 rooms took just 13 months. In 1913, Reamer designed an addition for the East Wing and in 1927, the West Wing extension. 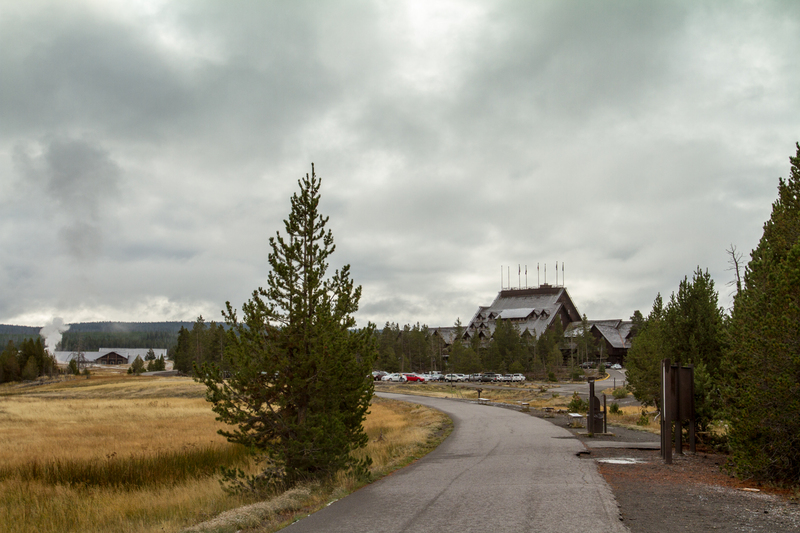 Today there are 327 guest rooms and the Inn is considered the largest log structure in the world. My room on the second floor came with two double beds, a small table/breakfast nook and 1960-ish feeling bathroom sporting some colorful animal tiles. Some suites are available, but don’t expect a TV or posh accommodations, just very comfortable ones. If you are lucky enough to stay in a National Park Lodge, you ought to bathe in nature and the hotel’s relaxed and historic ambiance. Pretty tough to beat that fact the I could actually watch Old Faithful Geyser from a window in my room; however, the outdoor patio offered exceptional views. By supporting sustainable cuisine, Xanterra is not only providing high-quality, healthy food to our guests, but is helping to support local food systems and drive economic growth. Xanterra believes that we have a special role as a steward of Yellowstone to protect the environment for future generation – which is why we strive to provide Legendary Hospitality with a Softer Footprint. I applaud their efforts and ate all my meals during my two-day visit in their dining facilities. 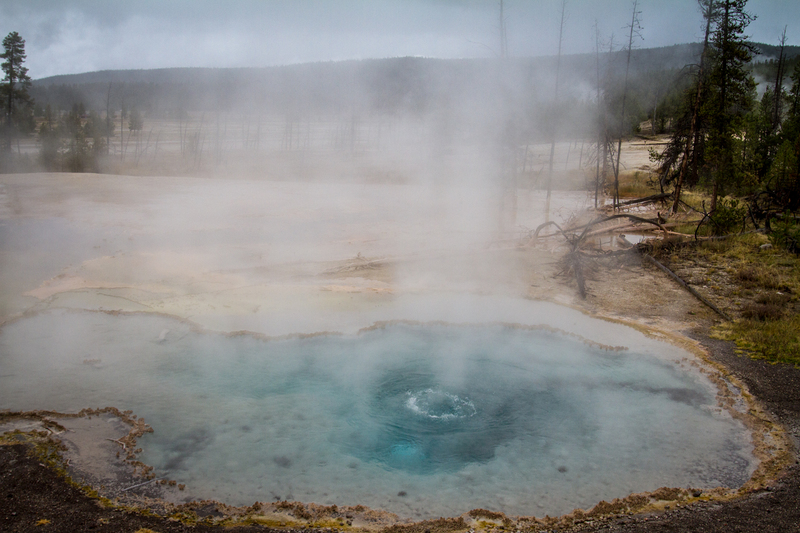 The following day I signed-up for the Firehole Basin Adventure: a three-hour exploration of some of Yellowstone’s geo-thermal wonders that starts at the Inn. 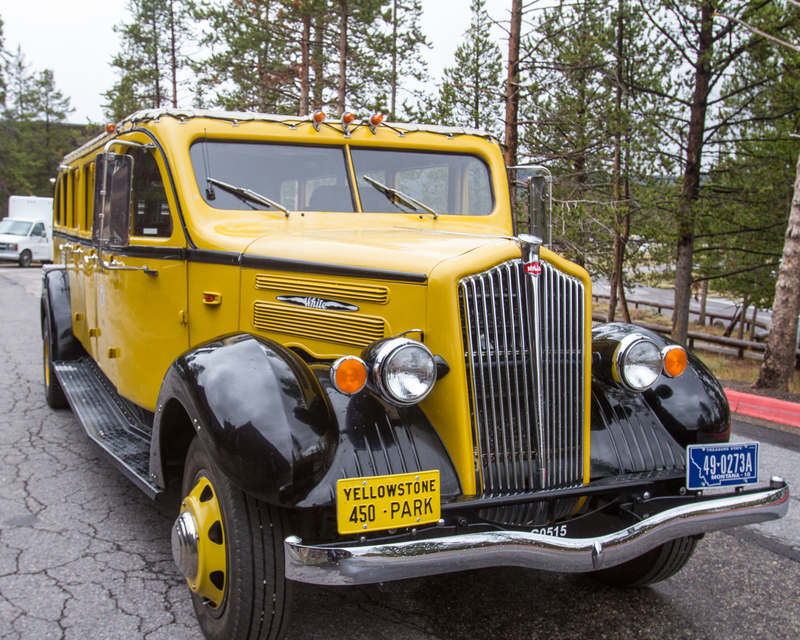 The tour utilizes a 1937 yellow wooden touring car, one of eight which Xanterra refurbished at the cost of $237,000 each. The windows are quite costly and delicate. In fact, my guide banned everyone on the tour from closing the doors. He did that himself, so as to not break any of the windows. While jaunting around the park, the guide explained hot springs and geysers. 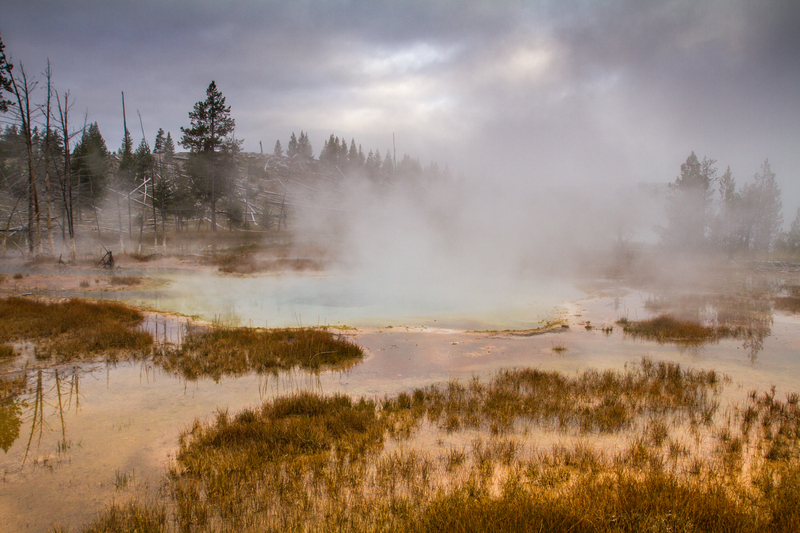 Yellowstone sits on a huge caldera, one that erupted 640,000 years ago. While the earth’s crust is normally 20-30 miles thick, the park’s magma rests just 1-7 miles below surface. Superheated water gets pushed up, and rises near the top. 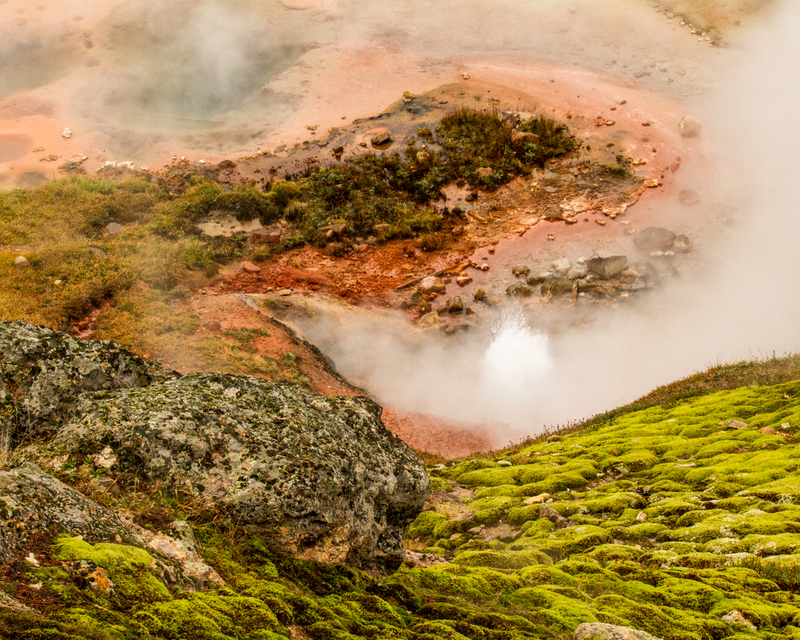 Constriction around the geysers from deposits of silica cause the pressure to build until the water finally shoots out. 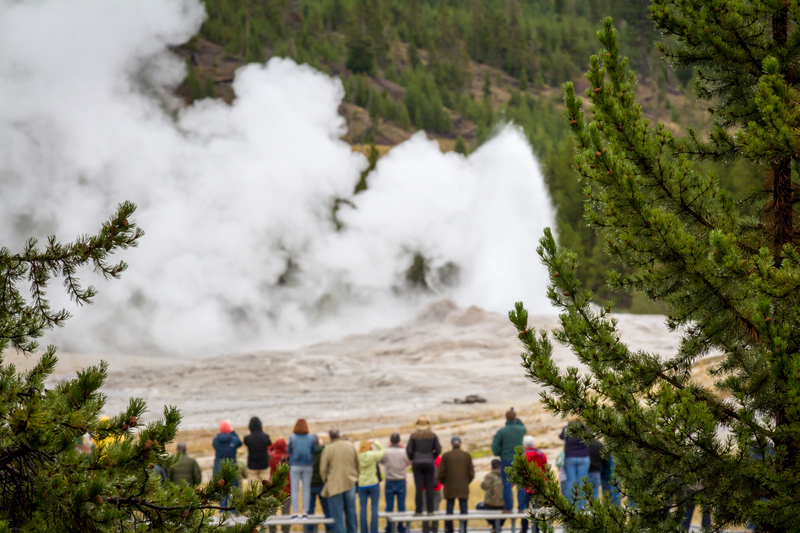 Old Faithful, the most famous geyser, erupts around 17 times a day and shoots a stream of water from 80-180 feet high. The next display can be predicted with a 90 percent confidence rate within a 10 minute variation. It’s quite a show but there are 250 geysers in the park and over 1,000 thermals. The Painted Pots area was particularly eerie and fascinating. The best part of staying at the Inn, however, is being right in the middle of the untamed wilderness. I just had to keep pinching myself. Before I left on my last day, I strolled to a number of hot pools and relished the magic of Yellowstone after an overnight dusting of snow. Fortunately I packed appropriate attire. Yellowstone’s wildlife, diversity and heritage will not disappoint. This National Park is an astonishing gift; see it, treasure it and pass it on. All photos courtesy of Debi Lander. Disclosure: I rented a car at personal expense for the drive to and from Yellowstone from Boise, Idaho. Many thanks to Xanterra Resorts who provided lodging and the complimentary Firehole Basin tour. Xanterra Parks & Resorts 866 439-7375 866 439-7375. 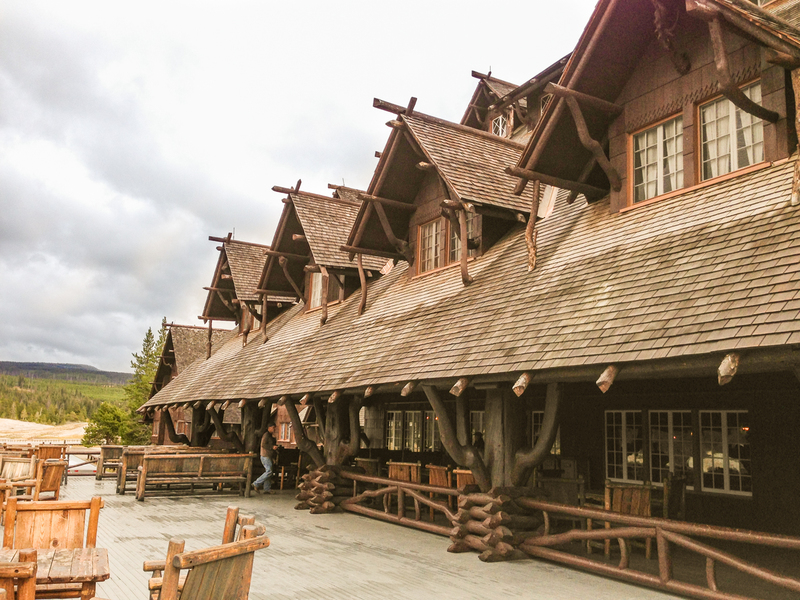 To read the Luxe Beat Magazine version of this article click on the title TWO NIGHTS IN THE OLD FAITHFUL INN, YELLOWSTONE.